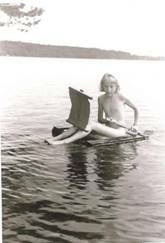 Anna Malm grew up in a small island, Stora Trappholmen, in Lake Sommen in the southern part of Sweden. 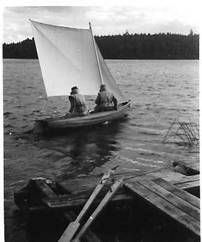 Boating and music were essential parts of life. She studied mathematics, chemistry and microbiology at the University of Uppsala and specialised in microbiology. She took part in a research project within the International Biological Program aiming at producing protein for human consumption from unicellular algae, and also worked as an assistant teacher in microbiology at the university. 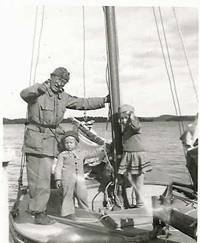 When her husband Krister Malm 1968 got a scholarship for his research project in ethnomusicology to record traditional music in the Caribbean islands she joined him on a small sailing yacht together with their 2 year old daughter Åsa. They visited around 30 islands during 8 months, ending up in Trinidad where they remained until 1972. Anna had a position as head of the microbiological division in the Trinidad Food and Drug Administration while Krister helped to build up the Government Folklore Archives. While domiciles in Trinidad&Tobago she and Krister adopted Eric, born in Trinidad 1970. Åsa had then started school. After returning to Sweden in 1972 Anna worked as a teacher of genetics at the Swedish University of Agricultural Sciences and also teaching microbiology laboratory assistants. She also worked as public health inspector. In the 1970s Anna was one of five applicants accepted to a Nordic conductor course. At the time she conducted choirs. From the early 1980s she worked as microbiologist at the Swedish Work Environment Authority. This work included preparing ordinances to protect workers from microbiological hazards, handling permits for work with dangerous micro organisms and negotiating EU Directives on biological agents and genetically modified micro organisms on behalf of the Swedish government and as advisor to Anna Lindh, Minister for Environment. The love for Trinidad steel band music resulted in starting Hot Pans steelband in 1984. Now the band is known as Stockholm Steelband. She has played with many steelbands in the Trinidad Panorama competition ( Merrytones, Birdsong, Icewater, Brimblers, Harvard Harps).